Dermarolling / Microneedling / Chemical peels in between facial dermarolling? > be needed for those areas, but I did not see that you sell a 2.0mm kit. I would advise you to do the chemical peels before dermarolling. If you are prone to acne or clogged pores, then Beta Hydroxy acids such as Salicylic acid are better since they get deeper into the pores than Alpha Hydroxy peels. Salicylic acid is fat-soluble and it is a mild antiseptic. It is effective in penetrating sebaceous pores and keeps them unclogged. DERMAROLLING AFTER A PEEL - WHEN CAN YOU DERMANEEDLE AFTER A PEEL? When the skin has fully recovered from a peel, you can start with dermarolling. How to know that you skin has fully healed? When it is still red, tender, dry or flakey then it has not. Before doing dermaneedling after a peel, your skin should be 100% back to its natural state how it was before you got the peel. How long that is, is totally individual and depends on the type of peel performed. GETTING A PEEL AFTER DERMAROLLING - WHEN CAN YOU DO A PEEL AFTER DERMANEEDLING? When the skin has fully recovered from dermaneedling, you can do a peel. Before getting a peel after dermaneedling, your skin should be 100% back to its natural state how it was before you did the dermaneedling. How long that is, is totally individual and depends on the needle length and how much you needled. I do not advocate using frequently deeper acid peels or any other relatively aggressive treatments in between rolling with long needles. The more is not always the better and the skin should be allowed to regenerate and remodel in between various treatments. It is very difficult to give general advice concerning the needle length for skin conditions due to the fact that the skin thickness varies depending where on the body it is. The thinnest skin is on the upper eyelids and the thickest is on the palms of the hands and the soles of the feet. When people want to roll against lost elasticity of their neck, they should not use 2 mm needles because the skin of the neck is quite thin. On the other hand the skin on the back or buttocks for example is rather thick and 2 mm needles may be appropriate to address stretch marks in that area. The proper answer to the question how long the needles should be to address loose skin is: They should be able to reach the dermis. 1.5 mm needles are often totally sufficient - but it depends how thick and tough your skin is. If you never get any pinpoint bleeding (occasional pinpoint bleeding is a sign that you reached the dermis), you could try 2 mm needles. But even just reaching the very upper dermis (no pinpoint bleeding) is enough to trigger new collagen production. If your skin turns red after rolling, you triggered the desirable processes. We will have 2 mm rollers for sale in just a couple of days from now. We'll announce it on the forum. 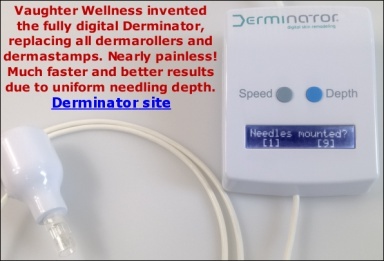 2 mm long needles might be too painful for you to roll and not even necessary so if you are a dermarolling "beginner" then 1.5 mm long needles are better to start with. A dermaroller will eventually get blunt and has to be replaced anyway so you can buy a 2 mm dermaroller the next time. I believe that dry brushing the area, accompanied by the external application of vit. C as well as massaging it with a mixture of fine salt with oil is beneficial to prepare the skin for dermarolling. In combination with a healthy diet, of course. You could also target individual stretchmarks with our single needle to crush the scar tissue. It is laborious. Nevertheless, you can needle just a couple of stretch marks every day (even while watching TV). Do not forget to disinfect both needle and skin beforehand. Buying a 0.2 roller for skin care product penetration enhancement is a very good idea as well and such a roller can be used up to 4 times a week. Apply a tightening cream, stretch mark cream (or the skin care product of your choice) onto the area and roll it in. It is difficult to find time for exercises when you have a baby but toning your muscles will usually make any skin problem look better. > do you think does this sound ok? Some people get pinpoint bleeding on their face from rolling with a 0.5 mm roller and some do not bleed even with 1.5 mm needles. It depends where on the body you roll and how thick and tough your skin is. If you were red afterwards it means the micro-damage and subsequent inflammation happened as it should. A 1.5 mm roller penetrates about 1.3 mm into the skin and that certainly reaches the dermis of the face. It should not be scaldingly hot, just hot and it will soften the skin and make it easier for the needles to penetrate. If you roll on your body, have a hot bath before that. The skin is in fact a very tough organ because the outer layer, the Stratum Corneum is our protection barrier against the outside world. This outer skin layer contains dead cells containing Keratin, the same material that hair and nails are made of and is therefore very hard to penetrate, especially by dozens of needles simultaneously. This is also how someone can lie on a bed of nails because the pressure is divided over many nails. The skin consists of 3 layers: The epidermis, dermis and the subcutaneous layer. The epidermis has no blood vessels at all and the dermis has a sparse capillary blood vessel network. If you got some pinpoint bleeding, you know that you reached the deep dermis. The dermis is your target when treating scars. Not every prick should lead to a bleeding spot because the capillaries are irregularly and sparsely distributed in the dermis. The depth of your single needling was correct. >please get back to me and thanks for great quality products and service! Dermarolling / Microneedling / DERMAROLLING FOR ALOPECIA? First I have to apologize - yesterday I stumbled upon a kind of "censor" feature on this forum that made it impossible to type postings such as yours (made with all-capital letters). I disabled it and I see that you posted several postings. Since you've been a forum member for quite some time, I suspect you've been trying to post before but your postings got rejected by some error message. Sorry if you got frustrated by that . Please, when your keyboard is producing capital letters, press the "Caps Lock" key that is located in the example below. That should fix it, otherwise press it again. Because all-caps postings are considered "shouting" and they are hard to read. As to your question: It is not sure that dermarolling her scalp will work at all, because her condition may be irreversible unless the underlying cause is addressed - which may be hormonal issues or auto-immune issues. Alopecia Universalis is usually an autoimmune disorder and that would mean that a dermaroller can not solve this. Dermarolling or needling sometimes causes hair growth in the places where there were no hairs, such as in scars. The likely reason is that the scars were avascular (no blood capillaries) and dermarolling triggered revascularization of that scar and that blood supply "feeds" the hair follicles. Not even rolling Minoxidil into her scalp will work, most likely. And be advised that rolling the entire scalp and rubbing Minoxidil into it can cause serious cardiac problems (low bloodpressure) due to overdosing, so only do small parts at the time. Minoxidil prolongs the growing phase of the follicles, but hers are either all dead or dormant, so Minoxidil would be a long shot. Start with 2% instead of 5% Minoxidil solution. Minoxidil works against Alopecia, but not with Alopecia Universalis. It is important not to damage the hair follicles with dermarolling, and because we don't know exactly how thick the skin on her scalp is, she should start with a 0.5 mm roller. If that causes some redness on her scalp, there is inflammation and a 0.5 mm roller is sufficient. It's beneficial to pour warm water over the head or take a hot bath or shower just before dermarolling, to make the skin softer so that the needles penetrate easier. If her scalp doesn't redden with a 0.5 mm needle dermaroller, she should use a 1.0 mm roller instead. Nobody knows for sure the cause of Alopecia Universalis, and the interesting thing is that sometimes, after many years, patients will suddenly recover and their hair will regrow. It is unknown why. This highly talented tattoo artist specializes in creating a very realistic "recently shaven head" look. If she has no eyelashes and eyebrows any more, she should visit a skilled permanent makeup artist. In the end, it may be that a wig turns out to be the only solution. Dermarolling / Microneedling / Single needles for sale? Yes, it is OK to dry brush a few times a week because dry brushing does not go deep into the skin. And you can even use a 0.2 or 0.25 mm dermaroller a couple of times a week to aid the penetration of skin products. A four-week gap is long enough, except when you've rolled very vigorously. Prolong the gap accordingly. I want to stress again that deep micro-needling requires long recovery periods, but they also yield the best results. However you can use a 0.20 or 0.25 mm roller up to 3 times a week for skin care product penetration in between rolling with long needles. You don't have to apply skin care products (vit. C etc.) excessively or very frequently. Set up a routine that is comfortable for you and you have time to stick to. Vit. A is destroyed by radiation of the sun, especially by UVA and that's why our skin usually lacks vit. A. Supplying vit. A to the skin is beneficial. Taking vit. A orally is not recommended because it is cumulative and you could end up overdosing yourself. Retin A (Tretinoin) is very good and I do recommend using it but not immediately after rolling because it is an acid and some of our customers got "burned" from immediate application. It's unadvisable to put such strain on the rolled skin. We think that a gentler form of vit. A should be used immediately after rolling (that's why we chose Retinyl acetate in our Infadolan ointment) and no acids should be put on the skin immediately after rolling, especially with long needles (unless you attempt to get rid of pigmentation spots). Freshly made vit. C serum made of L-ascorbic acid crystals is excellent for the skin but is also an acid and you should apply it to your skin before rolling, and continue applying a couple of days after rolling. Vit. C stays in the skin for up to 70 hours so there is no need to apply it immediately onto the rolled skin. It is much better to put it on the skin one hour or so before rolling. The skin consists of 3 main layers: The epidermis, the dermis (which contains mainly collagen and elastic fibre) and subcutaneous tissue. Subcutaneous tissue contains mainly fat and in it are veins, arteries and nerves etc. A dermaroller should not go deeper than the dermis. There are some cappilary veins (tiny bloodvessels) in the dermis so you might get some pinpoint bleeding with a roller with long needles and that is not a problem. But pinpoint bleeding should be the limit. Don't go any deeper. dermarolling for skin care product penetration doesn't need to reach the dermis. Merely the epidermis or even just the top part of epidermis should be punctured. That's enough for the product to penetrate. The skin on the thigh- and buttock area is thicker than facial skin, so rolling with 0.5 mm in those areas is a good idea although even a 0.2 mm would do the job. You can first apply the product and roll it in or roll first and then apply the product. I see I forgot to answer whether vit. A is better than Copper peptides. Yes, vit. A is much more important for skin regeneration than copper peptides. Copper peptides are a nice extra, but without vit. A, no good healing will result. You can use it, but better would be to use a non-acid form of vit. A. Stieva-a contains Tretinoin, which is acidic. I am a bit wary of rolling a heavy metal into the skin, and there is no safety data on that (not will that likely ever be produced). The company that makes the most popular brand of Copper peptides says that "Copper is good for you" and gives some examples why, but they fail to note that the more Copper you supplement, the less iron your body can absorb and use. So I recommend Copper peptides based on scientific evidence, but with some reservations about their long-term safety. To aid product penetration (incl. copper peptides) you should use a 0.2 or 0.25 mm roller, to roll two or three times a week. Not longer needles and not more often, whatever they may say elsewhere on the Internet! Longer needles disrupt the healing process from the 1.5 needles. Believe me, I base this advice on countless hours of reading the applicable medical research literature. The only way to improve your skin like this is slowly. People who report "no results" or "negative results" even though they've been "rolling like hell for months" have no results exactly because they have overdone it. Just as a body builder can over-train and ruin his progress. I am going to research, and write an article about Copper peptides soon and do not know yet where to get a good deal. I have done some cursory searching on Google Scholar and I already found an article written by a plastic surgeon saying how copper peptides have some effect but can in no way replace the much more effective vit. A. and should always be used in conjunction to vit. A. >to use it in this area? If you roll with needles longer than 0.25 mm, you should wait about five days with using botox or fillers. We sell a narrow 0.5 mm roller for under they eyes. You can buy it here: 0.5 mm "3-liner" dermaroller for under the eyes. >Botox or some kind of filler. First four weeks,you should only use < 0.3 mm needles. Don't use long needles when fillers have been freshly injected, wait about four weeks before rolling over the areas with longer needles than 0.3 mm because the rolling might speed up the breakdown of the filler. You can roll around it, just do not roll for four weeks directly over the areas that were injected with a filler. Do not perform any kind of microneedling over the botoxed area for the first two weeks. It can take up to two weeks for Botox to maximally paralyze the muscle (by blocking the receptors on the muscle). >If you have bottox on your forehead and coaptite filler (radiesse) in your cheeks, does rolling with dermaroller interfere and reduce their duration or is it safe? No problem with dermarolling after Botox but do not roll for two weeks directly over the Botox area and for four weeks over the fillers area with needles longer than 0.3 mm. Radiesse or other fillers are applied to the bottom of the dermis and the layer immediately below it (subcutis) and this is too deep for a dermaroller. If you want to be absolutely sure, stop using needles longer than a 1.5 mm and do not deep single needle the cheeks, directly over where the filler is. The needles of a dermaroller never penetrate the skin to their full length so there should be no problem even with a 2 mm roller. In the Botox area, you can use any size of needles and deep needling (after two weeks). >And, do you know any "home made" method to fill the cheeks other than the expensive filler by the dermatologist? No, there is unfortunately no DIY method. You can have it filled with you own fat in a surgery and supposedly, if well done, it lasts very long. Dermarolling / Microneedling / Applying 'anti-inflammatory' products after rolling/needling? "Basically, when the signs of inflammation (redness, swelling, increased heat, pain) are completely gone then the inflammation process is completed." It's impossible really to give an exact answer because the number of days depends on your skin and the needle length, prick density etc. So you should observe your skin instead. I hope this helps you..